Kirkcaldy to Leven (9 miles). TODAY IS memorable for its variety -- with romantic Ravenscraig Castle and historic Dysart village, picturesque Macduff Castle and Pictish cave drawings near East Wemyss. The route includes gentle strolls in Ravenscraig Park and Methil's Memorial Park, a sheltered woodland walk to West Wemyss, and a short scramble over landslips to Buckhaven. At Methil, you might even glimpse a North Sea oil rig docked for repairs. Ravenscraig Castle and Park Ravenscraig Castle is early 15th century. Massive walls and sloping roofs put it among the earliest castles designed to defend against cannon balls. It gained a romantic reputation when Sir Walter Scott used it in his Lay of the Last Minstrel. It maintains that reputation today with a scenic setting that invites lovers to explore nooks and crannies within its crumbling walls as well as on its grassy slopes. In recent years Ravenscraig Castle has experienced its share of official neglect, on both national and local levels. 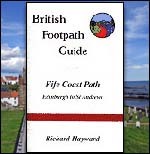 The growing popularity of the Fife Coast Path may help to change that. The castle can be reached by walking down the road to the car park at the foot of the crag, then scrambling up the steep slope. But it is much easier to stay on the main road until you reach the entrance to Ravenscraig Park. Enter the park and turn right in front of the public toilets. The castle is about 200 yards along this path. Ravenscraig Park is a miniature Kew Gardens, with an impressive variety of trees. Head gardener, Tom Smart, has a special relationship with most of them. The woodland park -- given to the town by the Nairn family --has been as nurtured as the castle has been neglected. Its beautiful and well-tended grounds extend all the way to Dysart. While the walk through the park is not the "official" route, it does provide a delightful alternative way to Dysart for anyone curious to compare Scottish parks to their English counterparts. The "official" route continues past the public toilets and takes the next path to the right. The path leads down to reach a small beehive doocot -- a smaller version of the one at Aberdour, although you can't go inside this one. From the doocot, you can descend steps to reach the beach. But the coastal path leads left through the woods. Just around the corner is a small turreted lookout shelter that provides good views back at Ravenscraig Castle and Kirkcaldy. Locals also use the shelter as a hide for birdwatching. When I arrived, a seagull perched brazenly on top, as if it were his personal "doocot." The route leads through the woods above an unusual zig-zag wall that locals call the "crazy wall." The wall contours the jagged coastline, and is said to have been built by a spiteful landowner to prevent miners from walking to work along the beach. Oddly, small doorways in the wall provide access to hidden caves and secret rendezvous nooks. At the Y-junction ahead, fork right. (Left leads back to the edge of Ravenscraig Park.) The forest walk continues, with rhododendrons beside the path. Ignore side turnings and the main path will eventually bring you up toward Ravenscraig Park once again. Just before the park, the coast path veers right and follows the coastline around the corner to reach a surprise view of St Serf's Tower rising above the whitewashed, red-roofed 16th-century village of Dysart.